* Here's part of the elderberry entry I am working on for my book. I decided to make elderberry ketchup instead of jelly with the berries we recently found on the San Marcos River -- see recipe below. Sprinkle the flower petals over any dish or extract the berry juices and make anything from jelly to wine. If there was an elder among all the wild berries, this one earns the distinction. References to elderberry appear numerous times in early cookbooks and medicinal texts, highlighting its ability to nourish and heal. Today, the elderberry is still respected as a powerful medicine, used in defense of everything from a minor cough to the flu, and an essential ingredient in some of the best country wines. Elderberry plants re-sprout from perennial roots each spring and can grow at least 5 or 6 feet tall. Their white flowers are called umbels and blossom at the top of long, woody stalks. The tiny white flowers eventually become small, purplish-black ripe berries whose heaviness often causes the umbels to droop over. 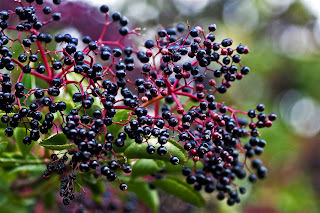 Elderberries are most common in the Central and Eastern part of the state though they can be found growing in areas that are moist and fertile anywhere, such as ditches and riparian zones or in wetlands. The twigs, stems and leaves of the elderberry are toxic, but the incredibly fragrant blossoms (available in mid-spring) can be eaten fresh by gently brushing the tiny, white petals into a container for your salads. They are also the main ingredient in elderflower cordial and elderflower wine. Beware: Elderberry blossoms are similar in appearance to poison hemlock flowers – always be sure you know what you are harvesting! If you do decide to harvest the flowers in the spring, be sure to leave the umbrella-like flowering head attached so the plant can proceed with the production of the much-coveted berries (there are species that produce blue or black fruits though the black-fruited Sambucus Canadensis is most common in Texas.) Picking individual berries one by one is time consuming – it’s easier to snip off the berry bunches all at once and de-stem them later. When the berries are at peak ripeness, they will easily detach from their stems though freezing the clusters first, then rubbing the frozen solid berries off the stems works really well. Eating raw elderberries has been known to cause some belly aches and they’re not very tasty anyway. It’s best to release their flavor by pouring hot water over them first and extracting their juices for use in jellies, pies, sauces, dressings, wines and other fruit-based dishes. To extract their juices, heat water to just before boiling (around 190º is good) and barely cover the berries in a bowl or pan. Let them steep for at least 15 minutes then mash them and strain the juice through several layers of cheesecloth or a jelly bag. Elderberry blossoms should be processed or eaten right away. The fruits can be frozen for up to a year and then cooked to make juice though it might be easier and less space-intensive to juice them right after harvest and freeze the juice. Berries will only keep 2 to 3 days fresh in the refrigerator. They can be frozen for up to a year. The idea of harvesting and using wild elderberries in cooking has deep, historical roots. In her 1888 book titled Family Living on $500 a year: A Daily Reference Book for Young and Inexperienced Housewives, Juliet Corson makes the thrifty suggestion to use elderberries and spices to make ketchup. This recipe is designed to make a small batch of elderberry ketchup but once you’ve discovered the perfect blend of sugar and spice to suit your tastes, you can make larger batches for canning. Jars of elderberry ketchup make unique gifts for the holidays. Wash the elderberries and remove the stems. Heat onion and vinegar in a saucepan until boiling, then simmer for 15-25 minutes or until the onions are tender. Remove from heat and add the berries. Let the mixture steep for 15 minutes. Mash the berry mixture gently with a potato masher. Press through a sieve. (note: A cone ricer or cone sieve works really well when attempting to extract fruit pulp.) Put fruit pulp back into a clean saucepan and add sugar and other spices. Simmer until it thickens, stirring constantly so that it doesn’t stick to the pot. Serve fresh or fill sterilized jars, place caps on the jars and process in a hot water bath for 10 minutes.